A couple of weekends ago, we re-arranged my kids’ bedrooms. When my five kids were all younger, my daughters shared one bedroom and my sons shared another. But now that my oldest will be a sophomore in high school and my twins are moving into eighth grade, they have later bed times, need more privacy, and have different interests than my youngest children. Even though I didn’t particularly want to go to the trouble of switching all the rooms, the kids kept bugging me about it. Besides, we’re blessed to have a house with five bedrooms. Even if I’d have to give up the office I’d made in one of the bedrooms, I decided I was willing to do that in order to give the kids more space. So . . . for two days straight we hauled books, bookshelves, desks, beds, dressers, etc. We have a TON of books in every room (surprise-surprise!). In order to clear out my office, we had to transport four bookshelves and all the books down two flights of stairs to the family room in our basement. Not only did we have to shift books, but I also had to empty closets filled with miscellaneous things so that we could hang clothes, etc. Of course, then I had to clean basement shelves to make space for the displaced items. In the middle of the back-breaking work, I couldn’t keep from asking myself, why in the world we’d decided to rearrange all the bedrooms. It was just too much work. I was tired. The kids were cranky. And the house was chaotic. Besides, I’d LIKED things the way they were. I wasn’t particularly fond of the change (since I was losing my office). If I’d had my way, I would have kept things the same. The fact is, change is HARD. Very few of us like having to turn our worlds upside down to make changes. We tend to shy away from plunging into things that require too much effort. The fear of the unknown holds us back too. What if things don’t work out the way we envision? Instead of moving forward and changing, many of us get entrenched in the familiar, easy way of doing things. We’d rather avoid the difficult unknowns. I see this a lot with writers and publishers. We get comfortable with the way things are. We tend to think, if something’s working, then why worry about changing? But . . . since the publishing industry is evolving and shifting and rearranging, then it seems only logical that we need to stay flexible and willing to change too. 1. Social Media: Obviously, some social media sites come and go. But if something becomes the newest rave, then writers and publishers need to seriously think about being there. 2. Publishing options: Yes, I’m traditionally published. But I’d be a fool if I didn’t keep my eyes on all that’s going on in the self-publishing world. And I’d also be narrow-minded if I didn’t look at how self-publishing is going to play a role in my long term writing career. Writers and publishers alike need to consider how to utilize all the publishing options to reach the most readers possible. Exclusivity is the mark of inflexibility. 3. Reader needs: No matter what we like to write, no matter how much we love our genre, and no matter our brand, we have to pay attention to what readers want. Their needs shift. And if their needs change, then that may require us to adjust the direction of our stories. I don’t anticipate that I’ll ever want to stop writing historical romances. I absolutely adore what I write. But, I have to remain flexible to the style and tastes of readers. I have to keep evaluating how I can best meet the needs of modern readers. Yes, change is hard. Transitions are painful and chaotic. But the payoff is usually well-worth the effort. 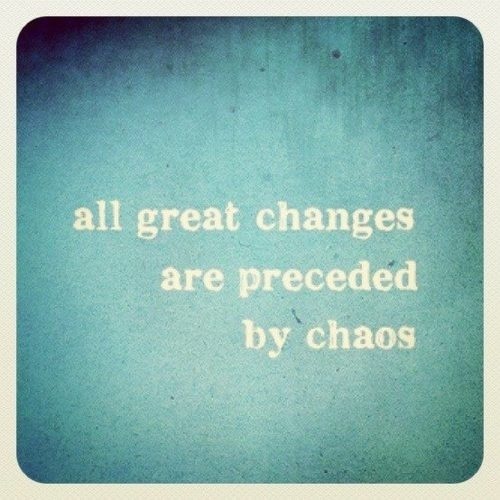 This pin I saw on Pinterest last week sums it up well: All great changes are preceded by chaos. My kids are now all happily settled. They love their new bedrooms. And I love the sense of independence it’s given my older children. I even have a pretty “office” in a corner of my bedroom. In the end, the work of rearranging was worth it. How flexible are you in this rapidly changing industry? Are you adapting or are you entrenched in what’s easy and familiar for you? In what areas is it hardest for you to make changes? You're right - adapting to change is so critical in today's world. In my day job as a government employee, we've just had a change of government for the first time in more than a decade and massive upheavals are happening every day. There's a lot of uncertainty out there, and at times I feel uncertain too. But I'm trying to look at it as a real learning and growth opportunity. I think that's a good way to think about changes we need to make in our writing careers too. If we can focus on what we can take from it, then every change has some positive - even ones we don't particularly agree with. Boy, can I relate to this one! Secondly, we are in the process of packing up our house, so I know ALL about the many layers of books and stuff! Can you believe this--the kids and I donated about 90% of our books to the Friends of Library sale. We realized we no longer re-read them (we prefer to head to the next book on our to-be-read list), so why not let someone else enjoy them? Not a solution for everyone, but it worked for us! Jody...I love posts like this, where we get to peek in on your family life:-) It's always neat how we can take lessons learned from one area of our lives, and apply them to other areas. That said, I don't exactly envy you for the time spent making all those room transitions! :-) It's definitely back-breaking work. Flexibility is a good and necessary thing in many areas of our lives. I have a constant need for wisdom, thought, in knowing when to patiently ride out the latest trends (knowing that their time is limited) and when to jump onboard and be part of it. It's a real learning process for me! What great post! And to sacrifice your office...that says a lot about you as a mother and a person. You inspire me! Hmm...some people claim that the publishing industry isn't changing enough and will be overthrown with another publishing model in the next decade or so. But that's just speculation. Jody, thanks for your excellent analogy to introduce embracing change. I couldn't agree more about Pinterest, especially since that's my target audience, as well. Personally, embracing my writing dream has meant substantial changes - all self-induced yet vital. It takes time, energy, giving up some things, and welcoming new experiences. I wouldn't change embracing change for all the novels in the world. Yay! I wouldn't say I'm entrenched in what's familiar. I would say I'm that duck, trying to stay calm and paddling like crazy to keep up with all the craziness that's dubbed the publishing industry right now. Funny thing is, my house is all at sixes and sevens right now too. It's half old siding, half new siding on the outside. My daughter, who is getting married in six weeks, is partially packed up. My guest bedroom is getting redone. So many changes. So much chaos. And I'll keep at it as best I can, knowing I'll never get it all done. I'm definitely trying to be flexible and go with the flow...I know I need to be a bit more active on Pinterest:) Thanks for the great reminders! Change is hard! But it also opens up lots of opportunitiews. I recently completed a Book Publishing class that challenged my thoughts on self-publishing. Must say it IS important to keep an eye on publishing trends. So glad your kids are enjoying their new 'space.' I'm sure they appreciate your sacrifice. Way to go, Mom!! I have to admit I don't like change, but realize change is inevitable. As for Pinterest, I have to put in a plug here. Since I first thought Pinterest was nothing more than pinning food & craft ideas, I balked at the idea of getting on yet another social network. But when you (Jody) and Rachelle Gardner blogged on how Pinterest can be beneficial to authors, I decided to give it a try. Within six weeks of getting on Pinterest, my e-book sells tripled. Let's just say, that made a believer out of me. Wow, Teri! That's fantastic to hear that your e-book sales tripled as a result of trying Pinterest! I'm so fascinated when I hear statistics like that! Just shows what happens when we use social media effectively! That is remarkable, Teri! Pinterest is so new that the possibilities are endless. I'm new to the publishing world and everything I read and learn is a change for me from my former preconceptions. I'm keeping my eye on all of it and hoping that when I am published it will be in God's perfect timing. I'm cracking up because guess what? We recently did the same thing. Our twins are 12, and they've always shared a room, but they wanted their own space. So we gave up our guest room, moved the office in there, and separated our twins. Plus all three rooms were in need of a paint job, so we painted 3 rooms (two of them I did by myself!) Whew, what a job! But now it's done, the twins are happy, and I'm happy with a de-cluttered space. You're so right about remaining flexible. I've got eyes on each area of publishing. Why rule anything out? Going to take a look at Pininterest now. Thanks for the reminder, change can bring good things into our lives. I've never been with good when it comes to making changes or accepting change. I'm the type of person who always orders the same food rather than try something new whenever I go to restaurants. But I do agree that it's important to keep up with what's new and different. I've even considered joining Twitter, because I've heard a lot of writers are on it. I think it'd be a good way to motivate myself to write something every day, even if it's just a few lines. What a project! I am not good with change, but it's inevitable, isn't it. Pinterest does seem to be exploding right now. It's interesting to see how authors use it. Flexi Solutions offer a range of customised height adjustable desks for use in the workplace, education and the healthcare industry.